I’ve had this recipe hanging around in my files for so long, I was almost ready to say, nah not gonna bother. So glad I bothered! Gently combine all ingredients together. 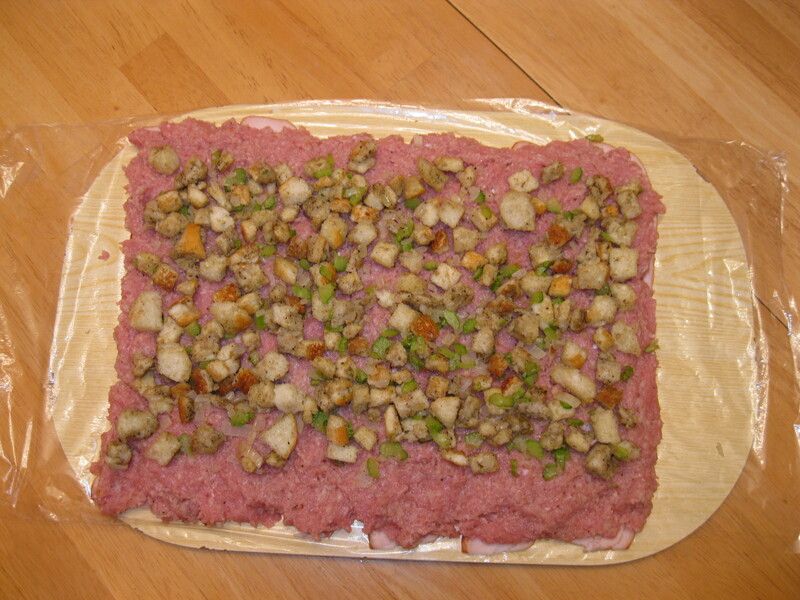 Form mixture into 1″ meatballs. Place on a lightly greased baking sheet and bake at 375 degrees F for about 12-15 minutes (depending on size). 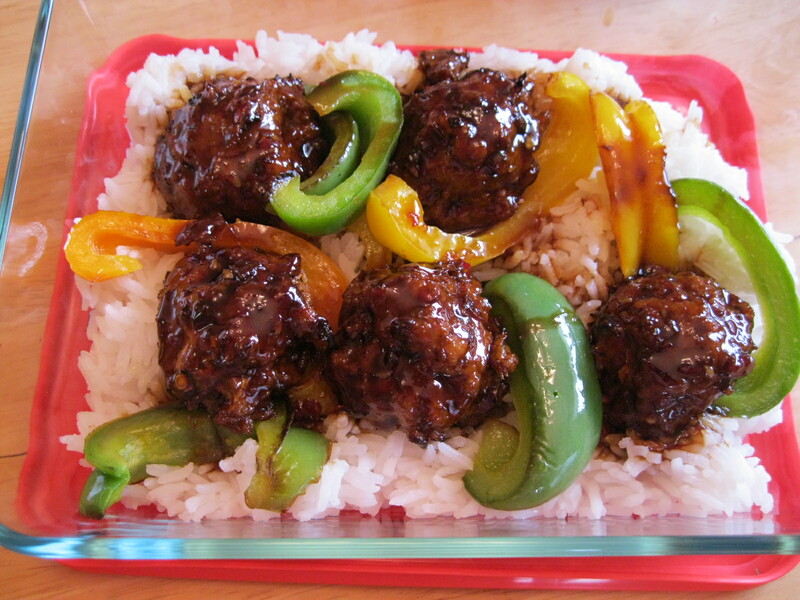 When meatballs are nicely browned and sizzling, transfer to a baking dish and drizzle sauce over top. Return to oven and let the sauce warm through, about 15 minutes. Stir once to evenly distribute sauce and coat each meatball. Mix all ingredients together and pour over meatballs. Serve with a fragrant rice (e.g. jasmine) and stir fried bell peppers. This is not so much about recipes as method. 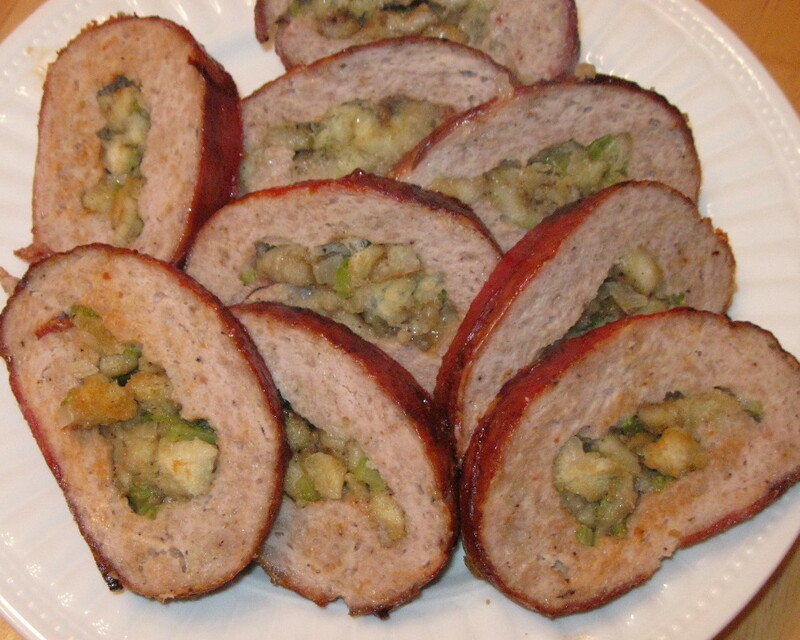 Use your favorite meatloaf and stuffing recipes. Here are my versions to get you started. Saute onions and celery in butter till tender. Add to bread crumbs in a bowl. Add seasonings and stir in liquid, combining all ingredients thoroughly. Set aside. Crumble ground turkey into a large bowl. In a small bowl, mix together panko and seasonings. Sprinkle over meat, add milk, and stir well. 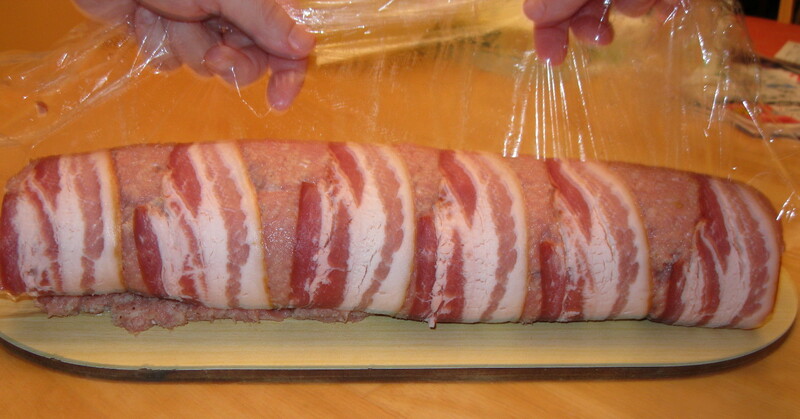 Lay down a generous length of plastic wrap lengthwise. 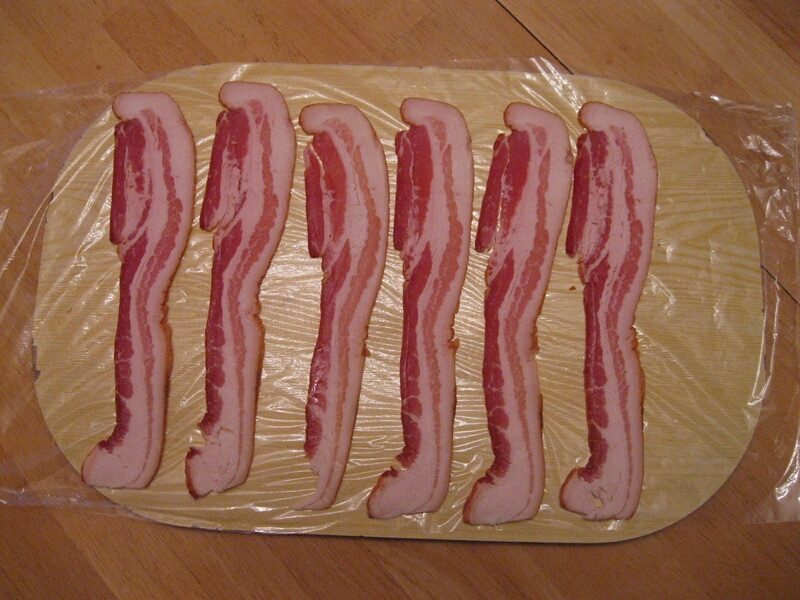 Arrange bacon strips. 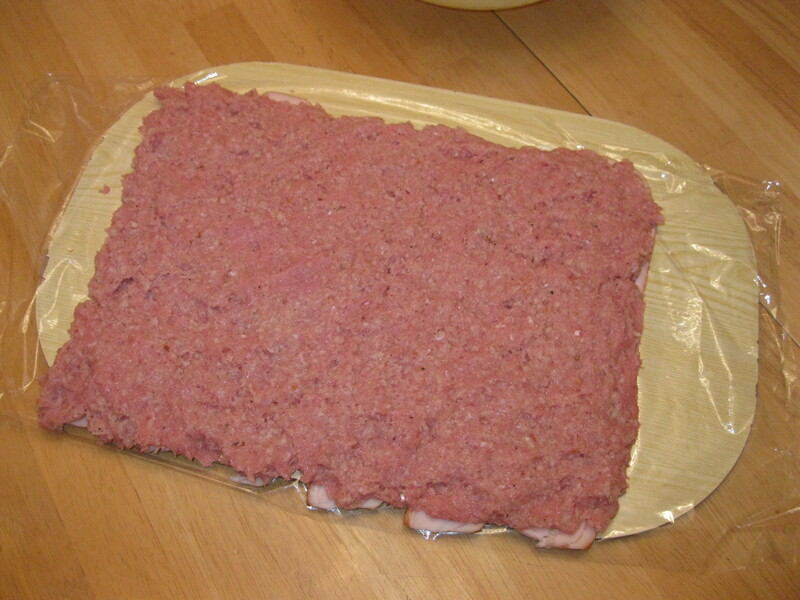 Over the bacon, pat out the meat mixture to form a rectangle. Sprinkle the stuffing over the meat. It might look like there’s not enough stuffing, but I found out the hard way that in this case, less is definitely more! Now the “tricky part”, grab the top of the plastic and begin to pull it (evenly) toward you to start the roll. Once it gets going it sort of rolls itself. Make sure to keep the plastic wrap free from the roll. 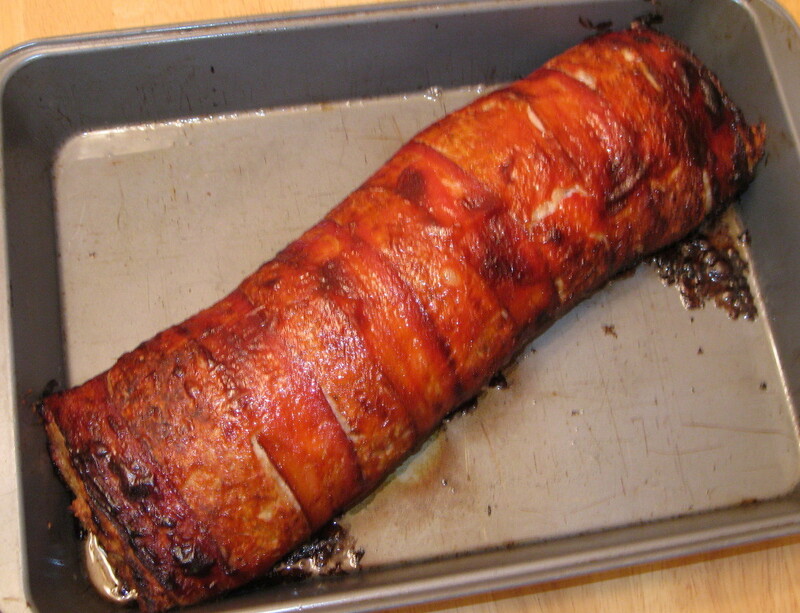 Plop the whole thing seam side down in your greased baking pan. 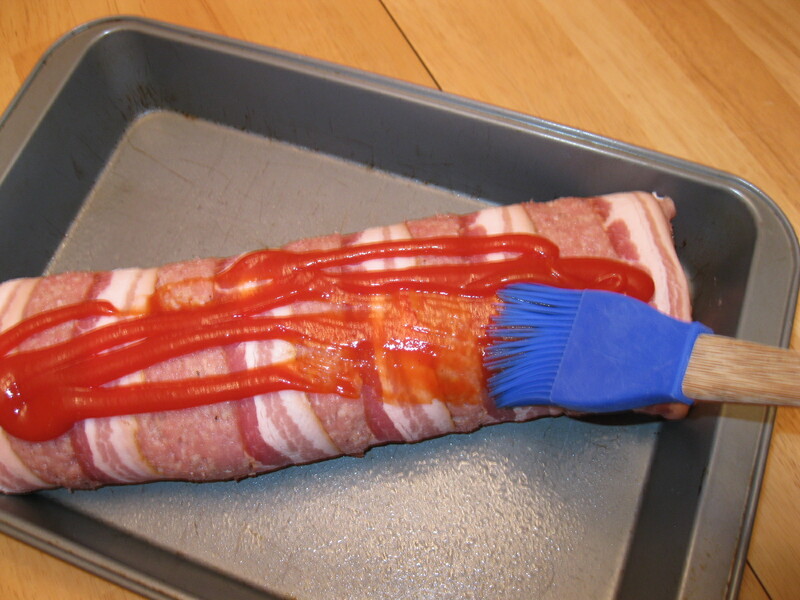 Brush the roll with ketchup. Bake at 375 degrees F for about an hour, but start checking for doneness around 45 minutes. Use a meat thermometer to make sure the inside is cooked through. Transfer cooked roll to cutting board and slice to serve. This is a fast and easy supper. It tastes good with dumplings, or couscous, or mashed potatoes. 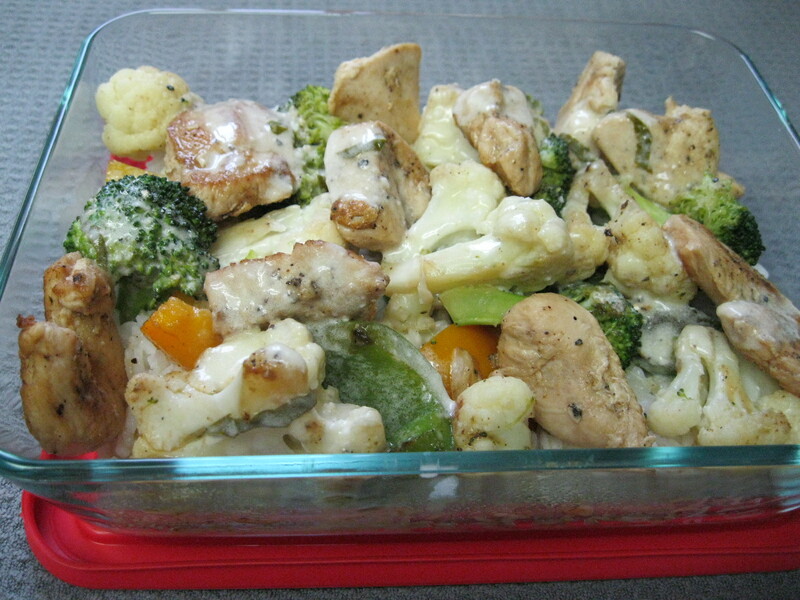 If I want to serve this to more than four people, I do the initial steps of browning the chicken and sauteeing the vegetables, but then I put everything into a large casserole and finish cooking it in the oven. In frying pan, heat a dab of butter over medium heat. Dredge chicken pieces in flour. Brown chicken quickly, seasoning with salt and pepper to taste. Remove chicken to bowl, keeping warm. 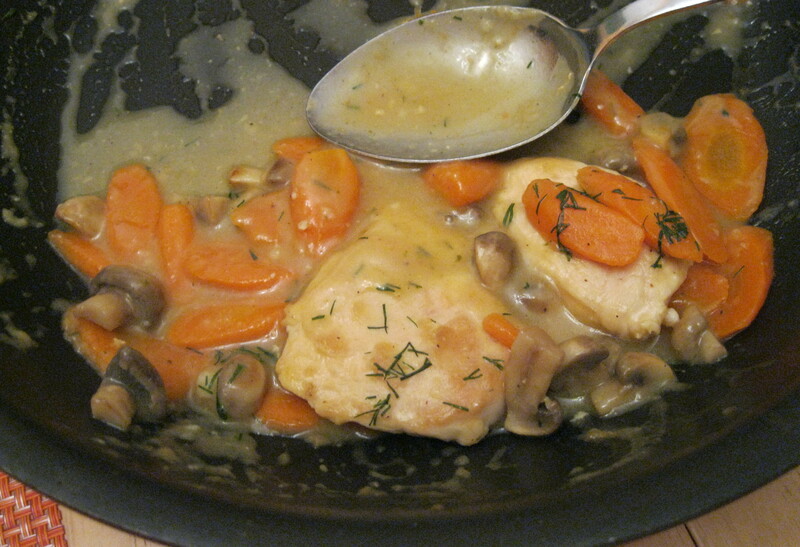 Deglaze frying pan with white wine, reserving liquid with the chicken. Reheat pan, adding a small amount of butter to saute chopped onion, mushrooms and sliced carrots about 5 minutes. Then add minced garlic and leftover flour from dredging, stirring to coat vegetables, cooking 1-2 minutes longer. Add chicken stock into the pan, bring to a boil. Return chicken and any liquid to the pan; reduce heat, cover and simmer, stirring occasionally until chicken is tender, about 20-30 minutes. Sprinkle with garnish just before serving. Makes about 4 servings. 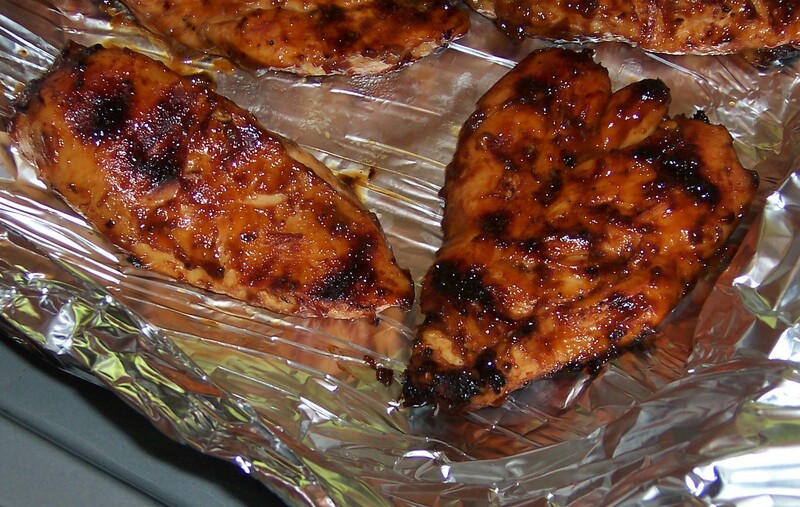 This is a quick way to prepare great-tasting chicken. The first time we made this, I was slightly weirded-out by the combination of sauce and dressing, but it’s quickly become a favorite at our house. I discovered quite by accident that ranch dressing instead of caesar also works very well (I guess the bottles are similar?). 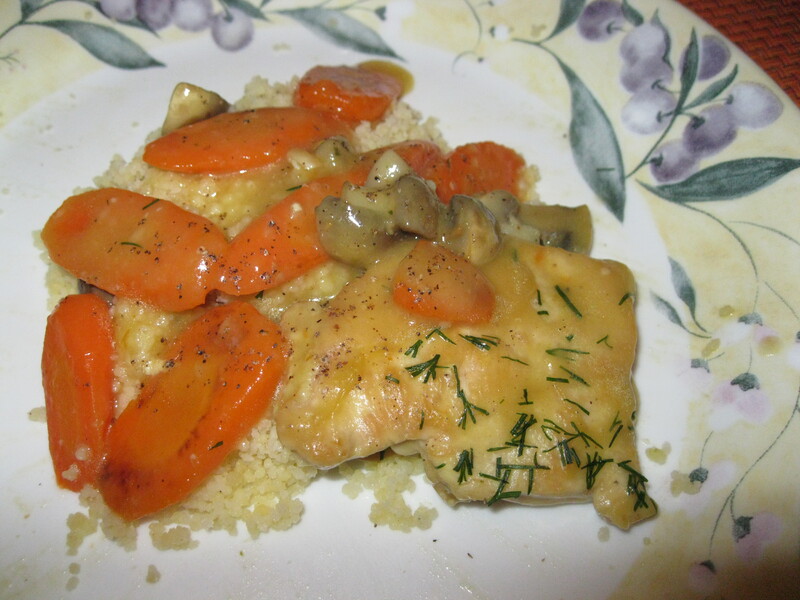 We have also substituted small, boneless pork chops for the chicken, and that works well, too. Combine bbq sauce and Caesar dressing together. Coat chicken in mixture and marinate for about 30 minutes. Grill as usual.